HAAS CNC Tool Room Mill, a fine piece of machinery. The HAAS CNC Tool Room Mill is a great machine to fill the gap between a clunky old manual mill, or a high end HAAS CNC machining center. The lower cost to operate the Tool Room Mill means greater profits, without sacraficing any accuracy. The HAAS Tool Room Mill, a super accurate, very crisp machine. Excellent finished parts and mold surfaces. Great HAAS machine. A great machine, we use ours for overflow and for small production jobs. It's great to be able to cut blocks on a HAAS Tool Room Mill, then finish the mold in our VF-1 HAAS CNC. It has been a real bonus to the shop. 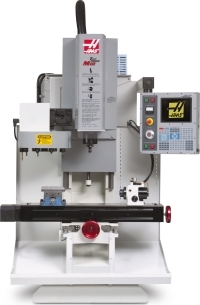 Click on the picture to visit HAAS CNC. Tell them Odyssey Engineering sent you. It's great for fly cutting, drilling and basic machining operations. The Tool Room Mill feels like a manual machine with super smooth controls, and an accuracy level that every HAAS CNC machines has. High tolerance (0.001) aluminum blocks for molds. Production parts for small runs and prototypes. As an overflow machine for cutting molds. For quick drills, where accuracy is important. It's a lot better than using the drill press. And it's even easier to set up the piece and get the job done with 0.001 accuracy. For doing small detail work, where the part is easier to see, and prepare the next cut. A great machine for training a new operator, or to help an old shool machinist feel more at ease with a HAAS CNC machine. A good place for "occasional/low priority" jobs, where you can set it up between the primary JIT (Just-in-Time) jobs, and keep an extra machine making products.